Samsung Galaxy Note 7 was launched in the month of August and since then we have heard about many accidents that cause the phone to explode due to its faulty batteries. The company has announced a full recall of the device sold before September 15, 2016 and all users who bought Samsung Galaxy Note 7 prior to that data and have the old battery in the device are expected to turn it off immediately and return it get a refund or exchange with other smartphone. However, the process of refund is not similar in every region and along all retailers or carriers. Here in this article we will give you the information about the steps need to be taken as per your location. This article will help you to return your Samsung Galaxy Note 7 according to the retailers you have bought. Not only that, we have included few locations, to return your Samsung Galaxy Note 7. AT&T is asking all the buyers to return Samsung Galaxy Note 7 on the nearest AT&T Store. Orders for Samsung Galaxy Note 7 prior to recall will be cancelled. The viewers can find the location of AT&T store in their region here. It is advisable to return the phone at the same location from where it was purchased. Once you take your smartphone along with the charger and receipts over there, the company will replace it with another handset of your choice and the difference in the amount will be refunded back to you. Those who purchased the device online or via the phone can also go to the AT&T store and if someone cannot manage to reach the store, then he/she can initiate the return process by calling 1-800-331-0500. Verizon believes that replacing the device online is more convenient than visiting the store that’s why they want all the Samsung Galaxy Note 7 owners to follow the return process through their website. The company will send a prepaid box to recover your Samsung device and Galaxy Note7 equipment charges will be credited to you. In case your situation is more complicated than you can either visit to the nearest Verizon store or call 1-800-922-0204 to return the device. T-Mobile wants users to begin the return process by visiting their stores. You can either go to the same place from where you purchased the device or find the location of the nearest T-Mobile store here. Be it any version of Galaxy Note 7, if you take it to the T-Mobile store along with the accessories then you will get full refund of the device and then you can apply that refund towards the purchase of any other mobile of your choice. Any difference in the price will be adjusted and given back to you. For further queries you can contact their customer support at 1-844-275-9309. Regardless of when you purchased the device, Sprint will replace all the Samsung Galaxy Note 7 with other smartphone according to the their return policy. The company is encouraging customer’s to book the appointment prior to their visit to the store to avoid long queue and wastage of time. Here are the steps that you need to follow if you purchased the device from Spring Store. Go to the website of sprint and make an online appointment, walk in appointments are available too. Bring the Galaxy Note 7 with you. If you choose a less expensive device than the difference in the amount will be refunded and additional cash will be required if you choose more expensive smartphone. If you decide to go for Galaxy S7 or S7 edge then you will get an additional $25 credit, which will reflect in next 3 bill cycles. 5. How Canadian Customers can Return their Galaxy Note 7? The return policy is quite similar in Canada and we are going to give the numbers of some carriers so that our viewers can call them and seek help in returning the device. 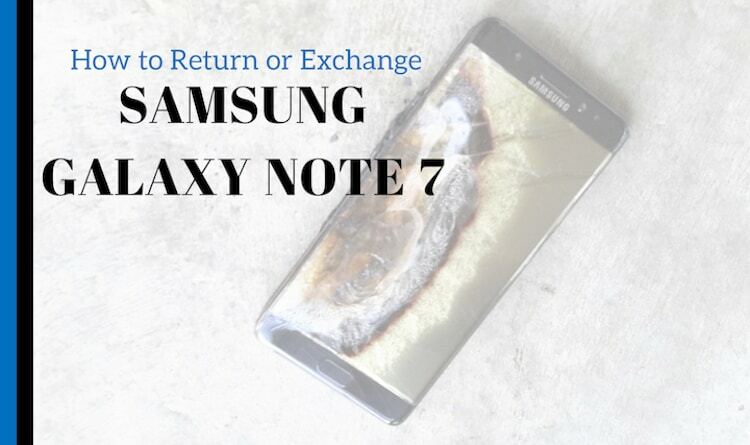 So, this is how you can return or exchange your Samsung Galaxy Note 7 depending from where you purchased it. Though, mostly all companies made the Galaxy Note 7 return policy easier, but if you find any problem, do let us know in the comments section below and we will try to resolve it.